Breathe in the wondrous, pristine landscapes of New Zealand. Board the famous TranzAlpine train, fly over the mighty Franz Josef Glacier and savour an overnight cruise on the majestic Milford Sound. Then, step it up a notch jet boating and white water rafting in the adrenalin pumping adventure capital of Queenstown. Moving northwards to Rotorua, let yourself melt away in the bubbling mud pools and thermal springs, before enjoying a relaxing jaunt in the turquoise waters of the Bay of Islands. Upon arrival in Christchurch, spend some time at leisure to relax or explore on your own. Perhaps visit the International Antarctic Centre or Orana Wildlife Park, New Zealand’s only open-range zoo. This evening meet your Tour Director for dinner and a welcome drink. friendly resort right on the waterfront. Enjoy dinner while watching the thundering surf at your door step. Today visit Hokitika, the heritage and cultural centre of the West Coast, for a greenstone (Jade) jewellery demonstration by a local carver. We then visit the West Coast’s newest attraction, a treetop walk through the canopy of this lush rainforest. Stop at the gold-mining town of Ross en route to Franz Josef, where we’ll take a guided tour to the viewing area at the mighty Franz Josef Glacier with a local expert glacier guide. Our eco-friendly accommodation is set amid native bush, with an emphasis on relaxation and rejuvenation. This evening, why not treat yourself to Franz Josef’s local geothermal hot pools or perhaps a massage. Dinner is at the retreat. Today is free for you to explore New Zealand’s adventure-capital. Perhaps play a round of golf or indulge in spa treatment. Tonight you’ll ride the Skyline Gondola to Bob’s Peak for dinner with a view overlooking stunning Queenstown, the awesome Remarkables and Lake Wakatipu. Make the most of your extended stay in Queenstown. Why not take an optional trip to the Gibbston Valley Winery, join a garden tour or take a jet boat ride down the mighty Shotover River. Tonight you can dine at one of the many local restaurants and cafés in town, or simply relax at our resort. We’ll travel south along the shores of Lake Wakatipu to Te Anau on the shores of the South Island’s largest lake. Later you’ll travel through the rainforest of World Heritage Fiordland National Park, sighting glaciers and mountain ranges before driving through the hand-hewn Homer Tunnel to the amazing Mirror Lake. Afterwards, we’ll walk to see the Chasm on our way into Milford Sound and take some time to kayak this majestic fiord, considered by many as the Eighth Wonder of the World. Tonight it’s a magical dinner on our overnight cruise on the Milford Mariner. You’ll cruise the length of Milford Sound to the Tasman Sea past waterfalls, mountains and wildlife. This morning we’re off on a Village and Bays tour before taking a lunch cruise on Paterson Inlet, where you’ll see many remote sandy beaches and wildlife. You’ll stop at Ulva Island and tour with the Department of Conservation on Ulva Island’s wildlife sanctuary. You’ll learn about native birds like the Weka and spend time up close to native flora and fauna. Tonight, try your hand at a bit of kiwi- spotting in the native bush near your accommodation. Board a ferry to the mainland. Admire the rural farming views of Southland as you travel back towards Queenstown. Travel over the Lindis Pass and into the MacKenzie high country, along the shores of Lake Pukaki to the foothills of Mt. Cook, the highest mountain in the Southern Hemisphere. Tonight enjoy dinner with a mountain view. Travel to Lake Tekapo, where you’ll stop to view the Church of the Good Shepherd. Later, join us at the home of Angie and Stan Taylor to enjoy a barbecue lunch in their 600 acre garden. Then travel along the Canterbury Plains to the Garden City of Christchurch. On a sightseeing tour see how the city is being rebuilt after the devastating 2011 earthquake. Today is at leisure. Perhaps join an optional Lord of the Rings movie tour, or even a cruise to Somes Island in Wellington Harbour. This evening why not venture down to the harbour to dine at a local restaurant or café. 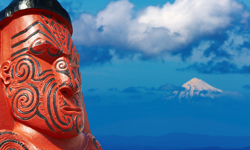 Travel the Kapiti Coast, past the dairy farms of Manawatu to Tongariro National Park to the alpine scenery of Mt. Ruapehu. Visit Taupo and drive along the shores of New Zealand’s largest lake. View Huka Falls and pass Wairakei Geothermal Power Station. We’re off to the highly entertaining Agrodome Sheep Show. Witness the art of sheep shearing, sheepdog trials, cow milking, bottle feeding of lambs and even a sheep auction. Your next stop is Rainbow Springs Nature Park. Discover native flora that grows around the crystal clear mineral water springs and you might even spot a kiwi or two! To complete our day, we visit the Whakarewarewa Living Village for an insight into Maori life and how they interact with geothermal activity. We make our way to the famous Waitomo Caves for an exclusive 5 star Eco Glow Worm experience. Your guide sets the scene for a cave experience where you will see glow worms, cave formations and appreciate the beauty of Footwhistle Cave. Next up is Matamata before a delicious lunch at Longlands Farm country-style restaurant. Now we’re off to the Coromandel to Puka Park Resort, where you’ll stay in Tree Hut Chalets, set among the native bush. After a leisurely breakfast, we travel to Auckland, New Zealand’s largest city. After a sightseeing tour, you’re at leisure to explore the town and try out the Auckland restaurant scene. This morning you’ll take a ferry across the harbour to historic Russell and enjoy a guided tour of the first European settlement in New Zealand. A local guide will also take us on a walking tour of the town. The rest of the day is at your leisure. We’re off to the Bay of Islands, where we’ll take a cruise to the famous ‘Hole in the Rock’; see historic Cape Brett as we explore some of the 165 islands in the bay. Later, you’ll have some time in Paihia for you to check out the local craft shops, go for a walk along the beachfront or just relax over a coffee with friends. We’ll celebrate tonight at a farewell dinner in Auckland. Say farewell to your fellow travellers as your Inspiring Journey comes to an end and we transfer you to Auckland Airport for your onward flight.